In this class, you will learn not only how to hold, hone, and sharpen your knives, but also how to Brunoise, Chiffonade, Batonnet, Supreme, Debone, etc... with proper technique. We will provide all the fruit, vegetable, and chicken needed for you to practice. The evening will conclude with a meal prepared with your cut up ingredients. Space is limited. Morning Section Hours 9:00am-2:00pm - Sold out! The ACE Professional Pre-Teen/Teen Summer Cooking Program includes 10 in-class sessions and a complete school uniform (monogrammed chef's coat, chef's pants, skull cap, and apron). A Certificate of Completion is awarded to those who complete all 10-day segment requirements and pass the final project. Guest Chefs and former graduates may come to some classes as guest instructors or to do a special demo in the class. We reserve the right to change class order, topic, recipes/techniques as listed due to unforseen circumstances such as unavailable ingredient, guest instructor/speaker cancellation or other emergencies. Coming soon: ACE Alumni Executive Chef Ken Biffar and Executive Chef John Paolone of Firenze Osteria and Cafe Firenze will teach a special class featuring their menu! Date TBD, check back for more details! Click below to sign up for our Single Classes. 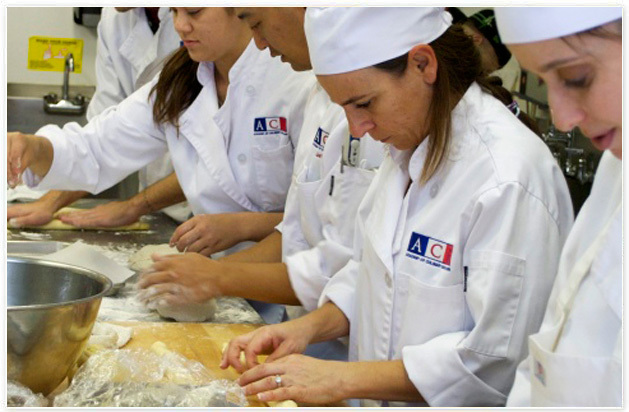 For cancellations made up to 48 hours before the class, Academy of Culinary Education will refund your class fee in full. Only a credit, which can be applied to future classes, will be given for a cancellation made less than 48 hours before the class. Academy of Culinary Education have to cancel a class, we will contact you by email or telephone and issue a full refund.